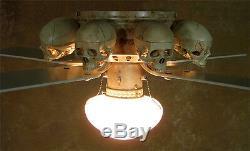 Skeleton Ceiling Fan w/ Skulls, New. Size: 42 tall wingspan, flush mount. 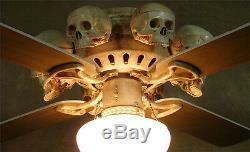 This unique skull ceiling fan with light is sure to make every one look up! 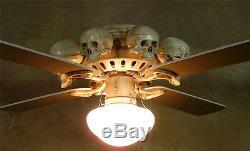 Comes with four fan blades and eight small skulls. 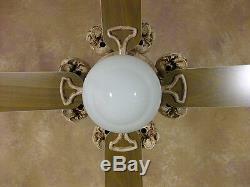 This is a flush mount fan with an arm span of about 42 inches and hangs down about 12 inches. Not only does it look cool, but it is a fully functional three speed fan with reverse. Light can either be on or off, with simple chain to activate. Never to early to start preparing for that Halloween air condition. This needs to be hard wired in to standard electrical and comes with complete wiring instructions. All hardware included, except for screws or bolts to mount bracket to ceiling. Light bulb included as well. We design and build all of our custom props. Some new items are directly from the manufacturers and will have full warranties. 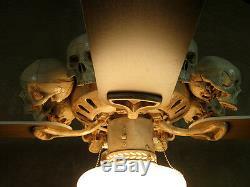 The item "Skeleton Ceiling Fan with Skulls, Halloween Prop, Human Skeletons" is in sale since Wednesday, April 13, 2016. This item is in the category "Collectibles\Holiday & Seasonal\Halloween\Current (1991-Now)\Decorations\Skeletons & Skulls". The seller is "cornemperor" and is located in Marcellus, Michigan. This item can be shipped to United States, Canada, Mexico, Bermuda.